Nintendo has a long history of keeping the development of their core titles in-house, so it’s a bit surprising when they allow another company to develop something as high profile as Hyrule Warriors. Or is it? This isn’t the first time a studio other than Nintendo has made a Zelda game. 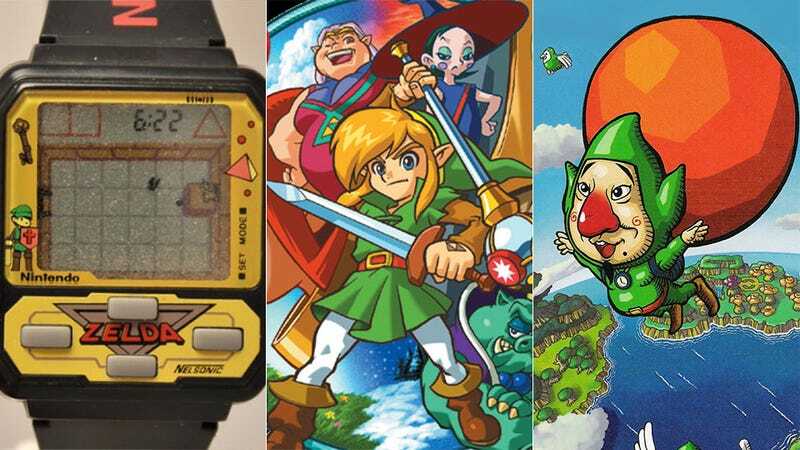 This LCD wristwatch comes complete with a Zelda game in addition to its timekeeping properties. It is a top-down action adventure game like the original Legend of Zelda but has no plot. Rather, it is a simple dungeon crawler where Link fights through eight dungeons with four rooms each. One of three games that came out of a failed deal to produce a Super Nintendo CD-based add-on, The Faces of Evil is a side-scroller like Zelda II: The Adventure of Link. As a CD-i game, it also comes with fully animated (but admittedly horrible) cut scenes. The story follows Link as he quests in a faraway land that Ganon has begun conquering. Released alongside The Faces of Evil, The Wand of Gamelon is also a side-scrolling adventure game for the CD-i. In it, as both Link and the King have gone missing, you play as Princess Zelda as she goes to search for them. The third CD-i game, Zelda's Adventure, is a top-down action-adventure game like the original Legend of Zelda. Instead of the animated cutscenes of the other two CD-i games, however, this one’s FMVs are done in live action with real actors. The plot follows Zelda as, with Link captured by Ganon, she must head out to save him. Part of the main Zelda series, this is the first in a pair of interconnected top-down action-adventure games on the Gameboy Color that play similarly to the original Legend of Zelda and Link to the Past. This game follows Link’s adventures in the far-off land of Labrynna as he tries to save the titular Oracle of Ages who has been possessed by an evil sorceress. Released alongside Oracle of Ages, Oracle of Seasons is a top-down action-adventure game set in Holodrum. This time, Link must save the Oracle of Seasons who has been kidnapped and imprisoned inside a crystal—thus causing the seasons to become erratic. Also part of the main Zelda-series, this game was originally included as a bonus multiplayer game included with Link to the Past’s re-release on Gameboy Advance. In it, Link takes up the Four Sword—splitting him into four separate people—to rescue the kidnapped Princess Zelda. Another top-down game in the main series, the Minish Cap follows Link and his talking hat as they attempt to stop the evil sorcerer who has turned Princess Zelda to stone. This game is a Japan-only DSiWare app that includes a Tingle-themed fortuneteller, timer, and coin flipping mini-game. In this Tingle game, a middle-aged man is sucked into a storybook world that bears a striking resemblance to the Wizard of Oz and is transformed into Tingle. The only way back to his own world is to dance with the princess.